PuzzleMad: I must be locking crazy! An extra post today just to show off something that arrived from my buddy Shane. I have known for ages that Shane has been working on another lock - this is the Haleslock 1 and is the first puzzle that Shane has produced for sale. He made a "big bunch" (don't ask how many) and let puzzlers know by email. We all did him proud as the whole lot all sold out in just a few hours - this shows just how sought after his work is. 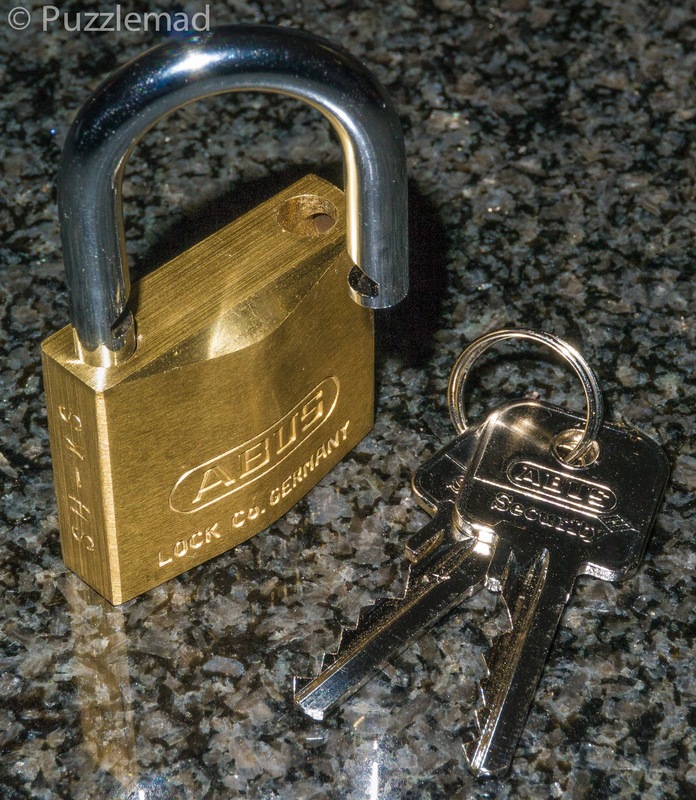 There will still be a few available from a number of other puzzle lock outlets/sellers but I am not sure when this will be as he still has to put them together. For some strange reason Shane keeps insisting on sending me puzzle number 01 of whatever comes out and I am hugely grateful to him. So far I have done a little exploring and noticed the "obvious" features and had a play. 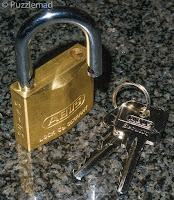 Unlike Shane, who has been a professional locksmith, I have very little idea of the details of how locks work and suspect that this will keep me stumped for quite some time! With all of Shane's puzzles the "rules" are that they can never be sold on - if a puzzler no longer wants one then it should be returned to him (like a puzzle loan) but with this series he has relaxed the rules. These can be sold on but Shane would like to keep track of where they are and so he should be notified when they are sold and who to. Good luck getting one - there are not many and they went to select puzzlers around the world so I doubt many will be resold any time soon. 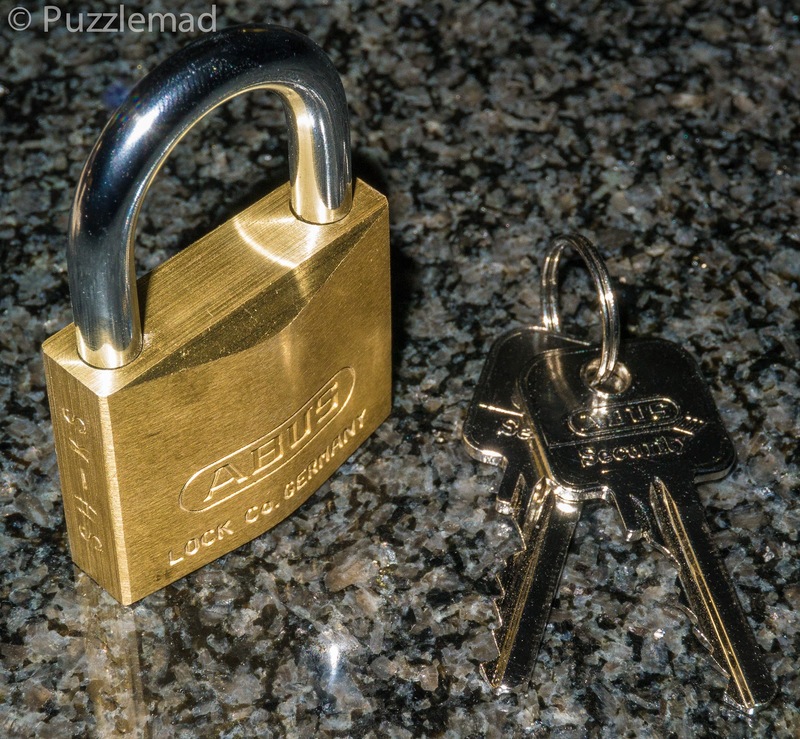 I have already received a couple of the interval puzzles - including his fantastic "Imitation" puzzle lock based on a design by Marcel Gillen and marvelled at the workmanship that went into making something like that at home. From the pictures it looks like an ordinary padlock but just like the Gillen lock there is a distinct knack to opening it. 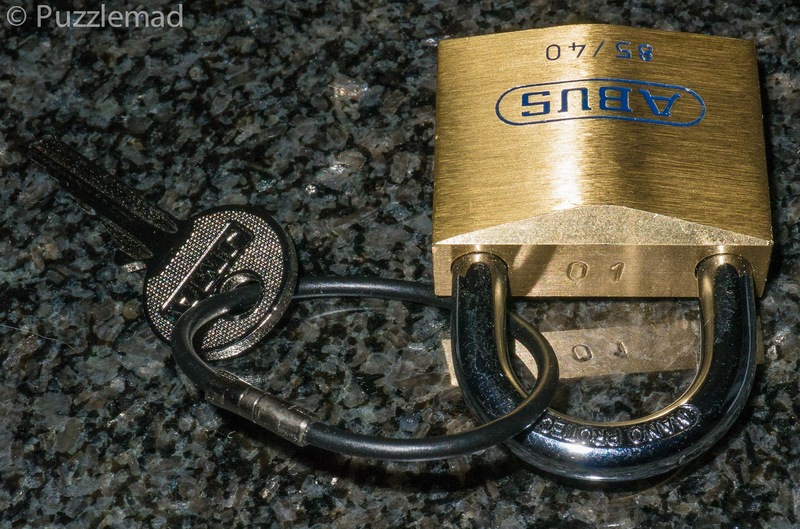 Looks just like a simple lock! 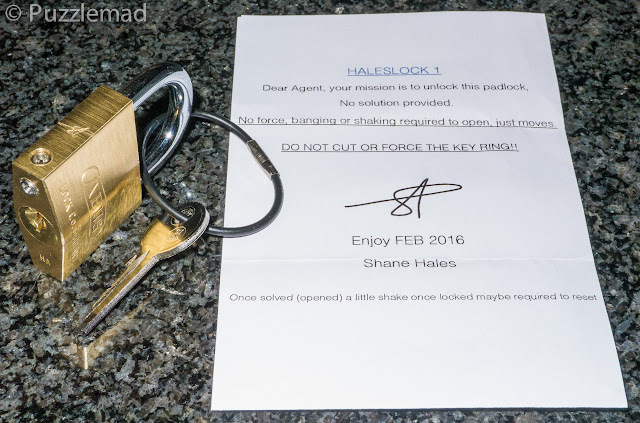 I think Shane must be taunting me because he knows that I have still not managed to open the Popplock that I received a couple of weeks ago at the MPP. It does all sorts of strange things but I still cannot open the damned thing! I'm just not very bright. The other Hales interval puzzle that I have and which sits in my dining room looking lovely with all the other wooden beauties is the Wirecutter. This was reviewed by Allard here and is based on a very clever physical principal. In a slightly simpler form, it is used to embarrass apprentice joiners and I have to say that it took me a good hour to work out what was going on and be confident enough to do what was required. Of course Shane would not have left it as the basic version - he added something to make it a little tougher and it had me stumped. The initials are proudly displayed! Thanks for everything mate - you have once again done the puzzle world a great service! There were certain people like Rainer Popp, Marcel Gillen, Nick Baxter, Allard, Me (and a few others) who could not be missed out! There was a certain amount pre set aside for personnel friends of mine. A good amount into a lottery. And some set aside for a couple of suppliers to sell, to give the unlucky people that missed out to find one. All made very clear in my emails. good luck. Made a few discoveries but still a long way from opening it! Thanks so much for a fabulous puzzle! Good for you - that took me some time! My car keys are on the same key-ring! Maybe ... but I do not collect puzzle locks. So I am unlikely to attempt this puzzle unless I attend MPP! You're always welcome to MPP! Awesome photos Kevin! Can we expect an update when you've opened it? I'm still waiting on mine, curious to see what he's accomplished. It's open now! It's clever and fun for a generalist like me. I love the challenge of these but am not good at understanding how they work.